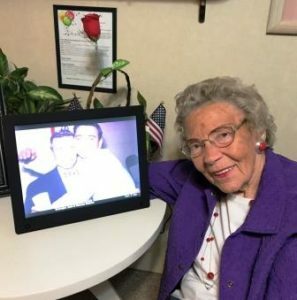 Grandma with her Digital Photo Frame – Best Gift Ever! What gift can you do you give a 95- year- old grandmother for Christmas? She lives in a small room in an assisted living facility – she has no room for “things” and really needs nothing. Well, this year we gave her a digital photo frame, never imagining the joy, entertainment and comfort it would bring. 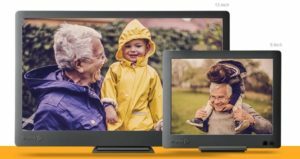 Although digital picture frames are not new, because of some of the features that this one offers, it turned out to be the Best. Gift. Ever. A photo gift is always personal, and can be one of the most touching and treasured gifts you can give. In this case, we loaded the frame with family photos of my grandfather, who died less than one year ago, my father who has been gone for more than twelve years, and all the rest of the family – my aunt and uncle, all the grandchildren and spouses and all the great-grandchildren, some of whom she seldom sees. One of the frame’s features is the ability to caption photos. I did not realize how helpful and important this would be. As she ages, my grandmother is having a hard time remembering names of even family members and how grandchildren and great-grandchildren are connected. Now, when she sees the photos and captions, we can remind her who people are, who they are married to and which grandchildren belong in which family. This hi-tech gift had the potential of being too much for grandma to operate, but because it is wifi connected, I was able to configure the settings so she needs to do nothing other than make sure it stays plugged in. I was able to set it up to turn on and off at specific times of the day. While it is on, there is a motion sensor that “wakes” the frame up when someone walks by it or waves at it, but it “sleeps” when there is not activity in the room. Grandma, who is very challenged by even the TV remote, doesn’ not need to do a thing. The wifi connectivity to the clould also allows me to manage the photos from anywhere using my computer or an app anywhere. Grandma was amazed and awed that I could add or delete photos, update captions and make other changes from my sister’s house a few miles away, or even my home in Texas, thousands of miles away!. I am still experimenting and learning myself, but I plan to add special little surprises and greetings for her birthday, and Valentines and Mother’s Day. I was able to visit her several times after we had the frame set up in her room. Each time I did, Grandma told me again and again how much she enjoyed it. She said that she spends hours watching it and that it keeps her company. She said, “it’s like I have visitors.” Since lonlinessloneliness has been her most mentioned issue since moving to assisted living, anything we can do to visit more often and make her feel less alone is important. Photos are special – they connect us and remind us we are loved. And finding the best way to present and share them is key. This gift connects me to my grandmother. Do you know someone who would enjoy something like this? I am Debbie Schott, Your Photo Helper. I have a passion for photos and the stories behind them. I am on a mission to help as many people as possible preserve and display the big and small memories that tell the story of who they are and who they love. Often that is in books or wall art but for some it is simply a system to sort, store and preserve the printed and digital photos or memorabilia collected over a lifetime. Once a traditional scrapbooker, I have moved to mostly digital books and love the freedom, flexibility, creativity and efficiency of digital books. I offer a variety of services and am here to help in a way that serves you best. Whether it is coaching and guidance for organizing your print and digital photos, helping you learning how to make your own digital books, scanning printed photos and memorabilia to preserve in a digital creation, or even a do-it-for-you level of service, I am Your Photo Helper. © Copyright 2019 · Your Photo Helper · All Rights Reserved.